OLEDs stand out for their high efficiency to transfer electrical energy into light. But they are very sensitive to oxygen and moisture. Therefore a rigid glass encapsulation is necessary and they cannot be integrated into flexible pages. 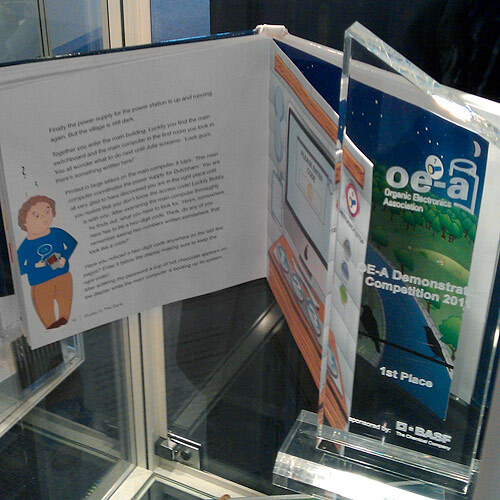 Therefore a green OLED from Fraunhofer IAP is in the front cover. 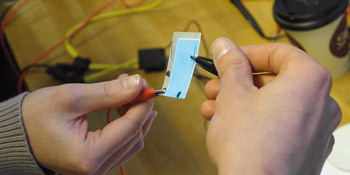 The battery charger from Schreiner Group containing a printed capacitor, resistor and antenna transforms a RFID signal into an electrical current. The power varies between 0 V and 32 V by the distance to the RFID reader. For a long lifetime of the OLED, it shall not operate at a power above 7 V. Hence it is necessary to control the maximum power by interconnecting rechargeable batteries from Varta. They reduce the voltage down to about 6 V and consume the energy not needed by the OLED. As side effect the OLED glows after removing the book from the RFID-reader. 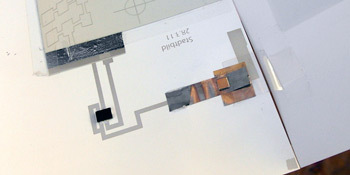 Inkjet printed conductive lines connect the components. The electroluminescent films are flexible and the best to be implemented in interactive games that feature flexible light emitting surfaces. For "Ducky in the Dark, those films were precisely structured by laser to fit the needs of the individual applications and to avoid the parts of the light emitting films to be covered with the paper. This step is crucial, because the bigger the glowing surfaces of the films the more power is needed. Therefore, keeping these surfaces as small as possible is important. The power supply by batteries requires the use of a single inverter for each display. Due to their electrical properties and small size Rogers Corporation inverters could be directly integrated into the pages fed by a thin rechargeable battery located in the back of the book. Unfortunately, the nominal capacity of printed batteries allows only a too short lifetime at the moment. Basically three different display layouts are used. Ready-to-use displays from NTERA and 2D and 3D screen printed displays applying Acreo electrolyte, Heraeus PeDot and DuPont insulator on Felix Schoeller paper. If a simple continuous object is to be activated, a relatively simple 2D construction is sufficient, where the single electrodes are separated by a laser cut gap in the PEDOT. Afterwards electrolyte was printed on top to enable the electrical current. If, on the contrary, the objects are requested to be highly structured, it is necessary to build a 3D-construction. Instead of the laser cut gap between the PeDot-layers a printed isolation layer filled in its open areas with electrolyte is used. The open areas correspond directly to the displayed text or graphics. Besides the fast charging time a relatively fast discharge is an important criterion necessary to get the book to the original state before reading it again. 3D displays are integrated in the page "Hidden Light Switch". The energy consumption for activating the displays is very low. Therefore the energy stored in Enfucell batteries or supplied directly by a printed solar cell from Konarka deliver the requested energy. 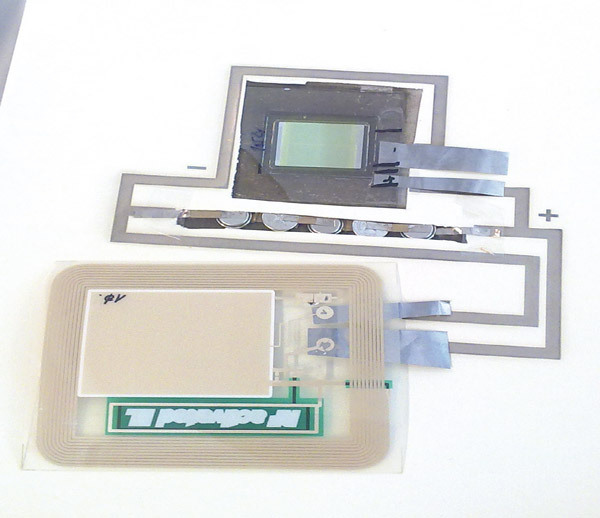 The printed batteries, the solar cell as well as the electrochromic displays and all conductive elements can be integrated into flexible pages. By the help of a magnet, the magnetic switch connects two power lines. 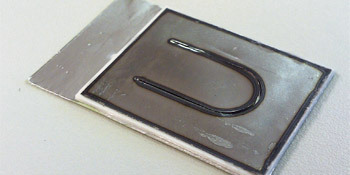 From the bottom layer, made of a 0.025 mm thick steel foil, the U-shaped platelet with the help of the laser is cut, which, under the magnet's influence, straightens towards the steel plate with the second printed conductor and thus connected allows the current to flow. To avoid the permanent contact between the two steel parts the 0.5 mm thick polystyrene spacer layer is integrated. The switch plate activates the city lights on the last page when it is opened. 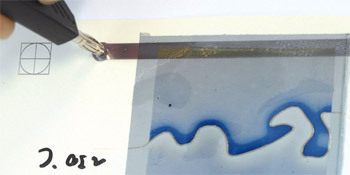 While opening the page a polyester film strip is pulled out between two steel foil contacts and closes the circuit. To ensure safe and continuous power flow, a small magnet on the nominal contact surface of the steel sheets is mounted. Conductive lines were either inkjet or screen printed on Felix Schoeller paper. Therefore a Printolux digital flatbed printing system was used and adjusted to the special requirements of printing nano silver ink provided by Bayer Technology Services. 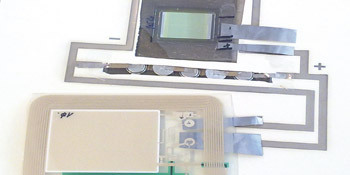 By numerous tests it was possible to determine optimal layer thickness, suitable substrates and advisable temperatures for the following drying process of the conductive lines. But these tests also made clear that problems like clogged jets or too high sinter temperatures for the substrate material presented challenges. 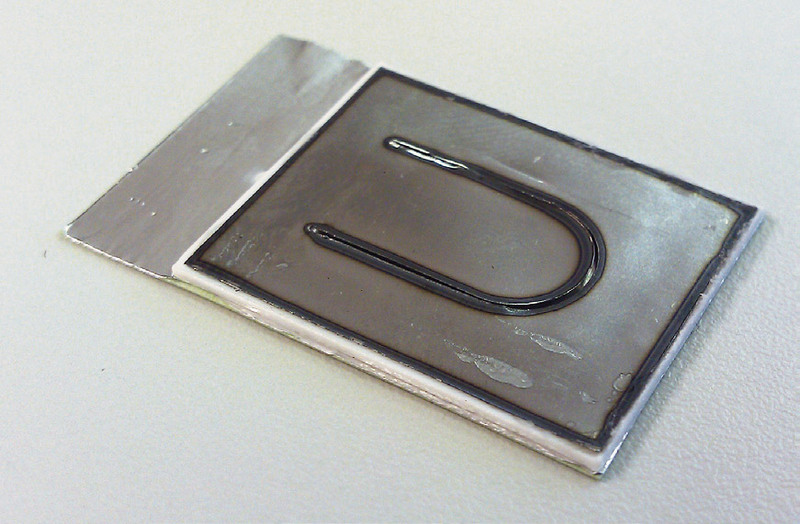 For high conductivity each line was printed in five layers and then sintered in a drying chamber at high temperature. The front cover is inkjet printed. 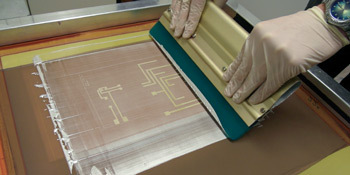 Due to the low process stability screen printing – as backup process – had to be used for all other conductive lines. 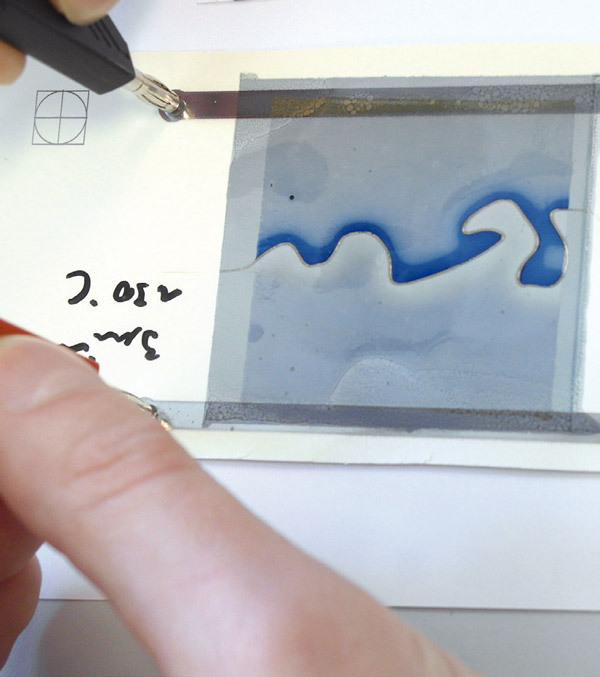 After drying of the printed lines inside the drying chamber, the ink has a very high conductivity. By aging effects the conductivity increases. During the project, the lines were optimized several times for achieving an excellent result. The printed lines are very resistant against dirt and smooth. But breaking or wrinkling the paper causes a great loss of conductivity.